The breakfast test will expand to Nashville this summer, the company announced during a webcast with franchisees. McDonald’s will reportedly expand its test of an all-day breakfast menu. The breakfast test will expand to Nashville this summer, the company announced during a webcast with franchisees, the Wall Street Journal reports. They also revealed plans to shorten drive-through menus and release new, mid-priced menu options. 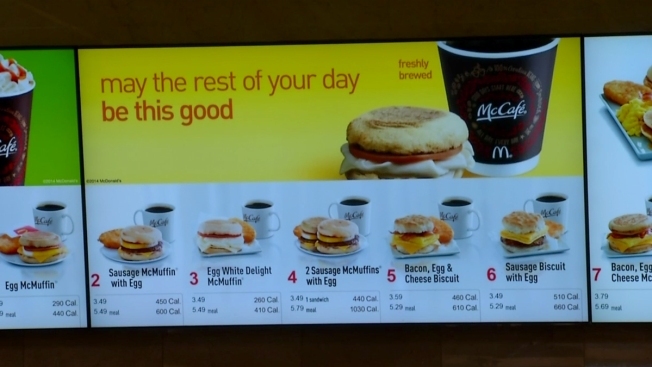 McDonald’s had been testing the all-day breakfast option at select restaurants in its San Diego market, the company confirmed to NBCChicago in March. "We know our customers love McDonald’s breakfast and they tell us they’d like to enjoy it beyond the morning hours," the company said in an earlier statement. "We look forward to learning from this test, and it’s premature to speculate on any outcomes. We’re excited to serve our customers in this area some of McDonald’s great-tasting breakfast sandwiches, hash browns and other favorites all day long." McDonald’s breakfast currently ends at 10:30 a.m. in most markets. The reported move comes as CEO Steve Easterbrook revealed plans to turnaround the fast food chain’s struggling business. It also comes as the company works to maintain its slot at the top of the fast food breakfast chain. McDonald's has long been the fast-food leader in the mornings, with its popular Sausage Biscuits, Hotcakes and other items pulling in roughly 20 percent of the company's U.S. sales. But the chain has faced stiffer competition in recent years, with competitors such as Starbucks and Subway rolling out breakfast sandwiches as well. McDonald's, which has more than 14,000 U.S. locations, has also said it plans to step up its marketing of breakfast as it faces intensifying competition. As for extending its breakfast hours, the world's largest hamburger chain is known for treading extremely carefully when discussing any tests or potential changes. Such matters are considered sensitive in large part because they would require the support of the company's network of franchisees. McDonald's did not immediately return NBCChicago's request for comment.